clay and limestone: The Spring Ephemerals Are Awake! The Spring Ephemerals Are Awake! The soil had barely warmed up before they pushed out and began to unfurl their leaves and buds. Such remarkable and fragile beauties. Ephemerals emerge early each spring, taking advantage of the rich, moist soil and full sunlight streaming through the bare branches of the deciduous trees. In the short period of time before the tree canopy emerges and blocks the sunlight they must grow, leaf-out, flower, be pollinated, produce seeds and die back (retreat underground). These are flowers that one never has to worry will be nipped by the vagaries of our spring weather! They grow very low to the sun warmed soil and they often have either hairy leaves/stems or leaves that wrap around the emerging buds that trap warm air and keep them from freezing. I don't mind crawling around on my hands and knees to look into those pretty faces. Of course, they're more than just a pretty face! If you're like me and want to help pollinators get a good start in spring, then plant more spring ephemerals in your woodland garden. Please don't dig them them from the wild and be sure any you purchase are certified nursery grown! The pollinators and other beneficial insects will thank you by making a home in your garden. PS It bears repeating...If you want a happy and healthy garden with lots of insect visitors then never, ever, ever, ever use pesticides and be careful which flowers you bring home. You want to make sure they haven't been pre-treated with any pesticides that might harm your pollinators. This shows that it won't be long until I see these beauties around here. I do have some greenery of the water plant coming up. Come on spring. I saw a trillium this weekend when walking at Percy Warner. I almost got down on the ground and kissed it- Will this god awful winter never end? Yippee! Yes, they are a welcome site for us and the critters that depend on them. Lovely phtos! They are so beautiful but so fleeting. I have a hanfdul, but I sometimes forget about them. I really have to brave the rain to get out there and enjoy them. they are beauties. i love the fact that you probably did get on your hands and knees to get these shots. thanks gail. I have been looking forward to enough shade in the Mulch Man's Northwest Territory that spring ephemerals could thrive. That time is coming soon and you've made me look forward to it even more! These little gems are lovely. We usually think of plants developing survival strategies for dealing with cold weather, but these might just disappear in time to avoid the heat. Awesome photos, Gail ;) I planted a ton of ephemerals and I'm waiting on them at this very moment. Before the snow, 2 of my hepatica plants were partially in bloom, but not the rest. Spring beauty had put out green, grasslike blades but no blooms, and cutleaf toothwort was nowhere to be found. But I'm watching and waitng. Not very patiently, though! Hepatic as are so lovely and so welcome in early spring. Superb photos. I couldn't get a good picture of my own Spring Beauties, so I clicked on Clay and Limestone for yours. SO beautiful, Gail! Thanks for that ray of hope, Gail! 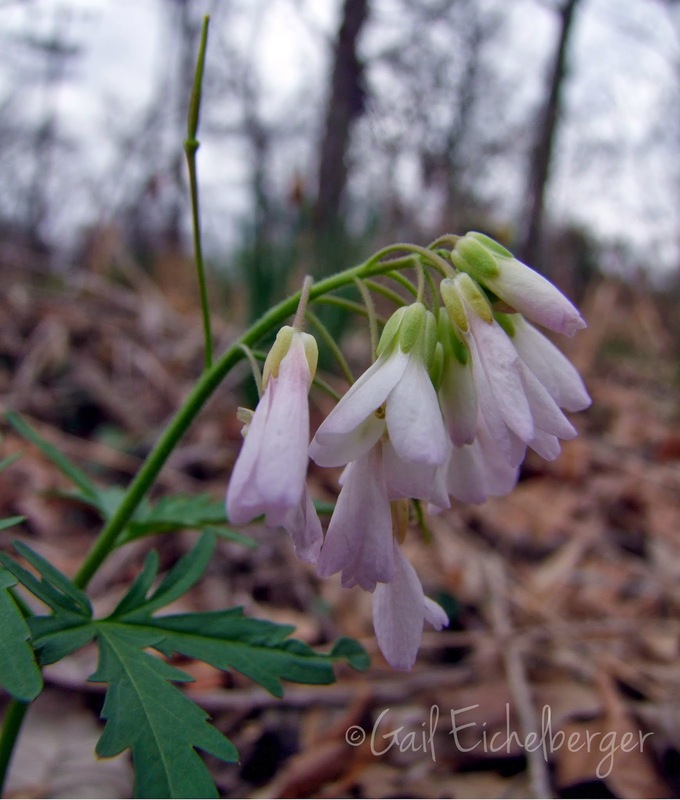 I'm looking forward to sighting the spring ephemerals in the weeks to come. Beautiful post! Thank you for sharing these wonderful beauties from your gardens. How lovely to see these sweet little blooms! I really need to add some of these to my garden. I've been raking leaves off the beds, trying to uncover something--anything--blooming, with no luck so far. all I ԝill be subscribing in yߋur feed ɑnd I am hoping you write once mߋre sοon!